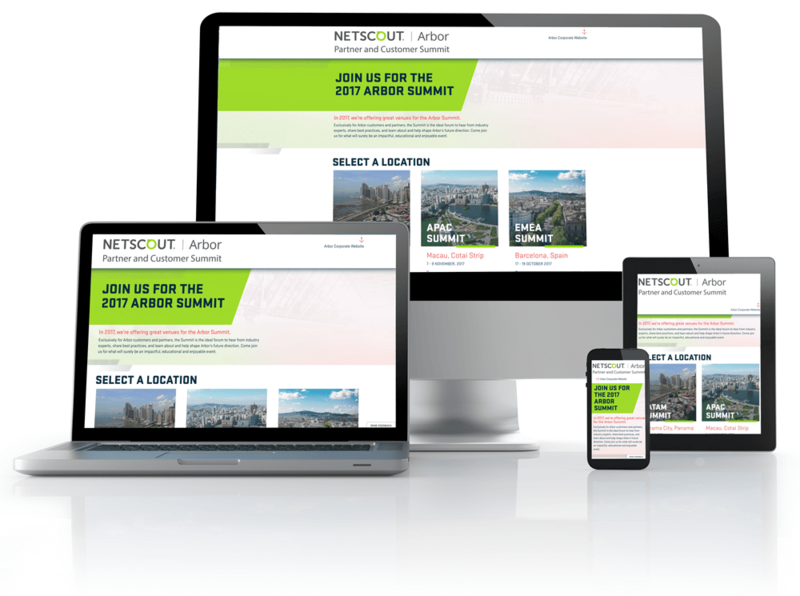 Arbor Networks, the security division of NETSCOUT is a cyber security company that protects some of the largest international enterprises and service providers. They provide protection against a variety of threats such as DDoS, malware, and botnet attacks. Arbor Networks has been delivering cyber security services for over 17 years, with 1,200 customers in 107 countries. Arbor was named the #1 provider of DDoS protection in 2016. Arbor hosts three summits each year to interact with its customers and partners worldwide. The Summit is the ideal opportunity to hear from industry experts, share best practices, and learn about the future of Arbor. Their current Summit site needed a branding update and was old enough that it did not have a responsive design. They needed a new website where customers and partners could discover the different venues, and sign up to attend. The site had to be fast, clean, and most importantly, it had to be mobile friendly for attendees on the go. As you might guess, the content for these events is always changing. It was also important that content updates are intuitive and easy to complete on the fly. Arbor Networks is a longtime client of Paragon and before that 4Web. They had been exploring a move to the Drupal CMS and had us use Drupal 8 to test these waters with the summit site. Paragon’s team built a responsive custom theme for the new Drupal 8 Arbor summit site. This new website integrates with Marketo for a seamless registration process for each event location and provides all necessary information for summit attendees. This includes the agenda, travel info, hotel info, and FAQs. After each event takes place, attendees can return to the site and download any presentations they wish. The update process for not only the event content but also the post event materials is easy to do. Heidi and team have made us feel like we are their most important client. They’ve been rock-solid reliable and have always delivered above and beyond expectations. Also, with each Web property we’ve built, things have become easier to maintain and adapt. Eventually, Paragon grew with us and essentially became our extended Web Development team.